I guess we couldn't have asked for a better day to release Golden Beach Pale Wheat. 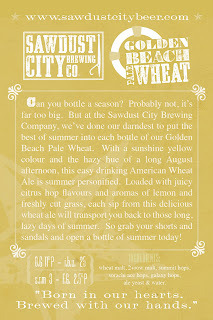 The first of our 5 mainstay releases, Golden Beach Pale Wheat, was originally designed to be our summer beer. An easy drinking, hop forward American Wheat Ale, this beer calls for a sun soaked patio not a snow packed porch. But if you've ever had a day where you want to recapture those lazy afternoons of August, this would most definitely be it! Have a read from our label and table topper, it will give you a pretty good idea as to what this beer is all about. Better yet, come out to the Griffin tonight and sample some for yourself! If you don't happen to be up North, try these great beer bars in Toronto - The Only Cafe, Burger Bar, C'est What?, Highway 61, Grapefruit Moon, Bryden's and Cafe Volo, they will all have our beer on tap as of tonight. It's been almost a year and a half since Rob and I met in his garage in Gravenhurst, but now the day has finally arrived, Sawdust City Brewing Co., will officially be selling it's first pints tonight at the Griffin Gastropub in Bracebridge ON! We're all super excited, Rob and Karla are making the long and apparently snow covered voyage from Gravenhurst to Bracebridge tonight and we'll be celebrating the fact that we can now buy our beer in our own pint glasses! Hazzah! It's funny that Golden Beach Pale Wheat is our first release. The name of the beer comes from the road I grew up on, Golden Beach Road. The road itself is a windy Muskoka-esque road that branches off highway 118 as you make your way from Bracebridge to Port Carling. It curves along the Muskoka River, passing lovely homes and cottages and of course past the towns largest tourist attraction (and claim to lame....I worked there for 6 years...dang), Santa's Village. After passing "The Village" Golden Beach Road turns into Santa's Village Road and then it snakes its way back into town. If you follow the road around, from Golden Beach to Santa's Village Road, through town,onto Highway 118 and then back to the start of Golden Beach Road it makes a "loop". I used to ride my bike around this loop when I was a kid. It's about 10-15k I guess, but it seems like 10-15 years since I've done the loop. And it seems almost fitting that, like when I was a kid and I'd ride the loop, Golden Beach Road has now brought my entire life full circle. 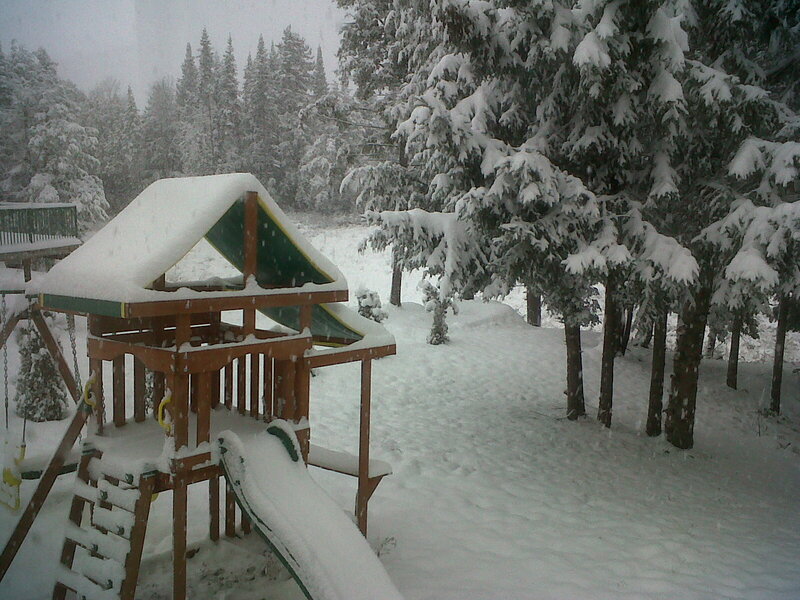 When I moved out of Bracebridge after University, I never thought I'd be back. The jobs I had back then didn't exist up here. But since that time, I've changed careers and frankly, you can brew beer just about anywhere. It's basically a Universal job. People drink and brew beer every where on this planet. Humans have spent the better part of their existence learning how to get drunk. We've gotten pretty good at it. But even though I can brew anywhere, I'm glad I'm doing it here, in the town I grew up. So here I am, about 15 years after I left, back where I started. My life is a whole lot different than when I left, but then again so is the town. 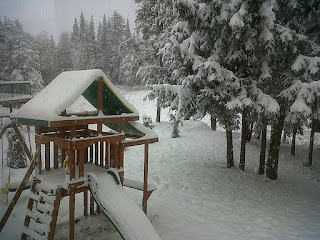 But I'm glad to be back and I'm proud to be plying my trade and brewing beer in Muskoka. 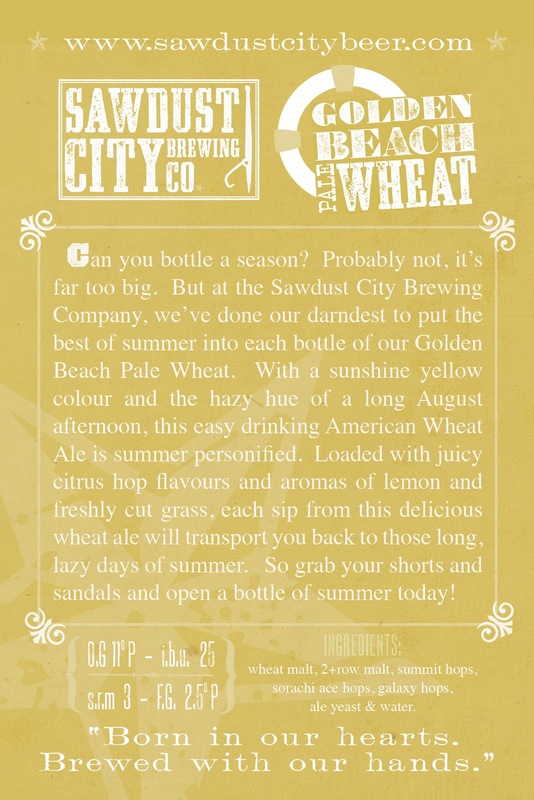 If you get a chance tonight, stop by the Griffin, grab a pint and feel free to say hello to Rob, Karla and I, we'd like to meet you and we'd love to hear what you think about the Sawdust City Brewing Co.. We hope you like it. Anyhoo, that's about it for this time. Until next time, keep the beer in your mugs and the sawdust beneath your feet.